Wisconsin’s Geneva Lake is 5500 acres, about 9.5 miles long, 2.5 miles wide, and 145 ft. deep at its deepest point. Popular with visitors from all over, Geneva Lake offers a diversity of water activities that makes patrolling it particularly challenging, and Water Safety Patrol particularly necessary. The lake drops off very quickly, and swimmers may find themselves way over their heads only about 50 feet from the shore. Jet Packing, where a rider flies about 30-40 feet above the water, has come to Geneva Lake. These Jet Packs are a sort of motorized form of Parasailing, which is also popular. 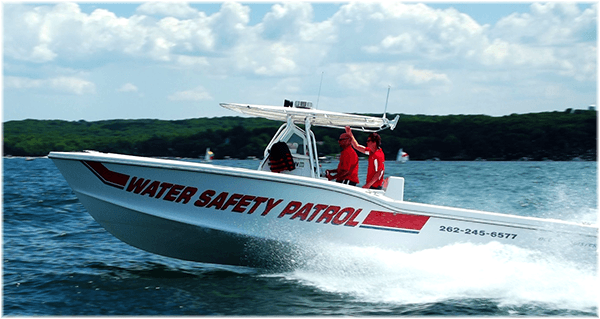 Fourteen beaches, watercraft of all sizes, tubing, and waterskiing keep the Water Safety Patrol responders busy. Ted Pankau is the director of the Geneva Lake Water Safety Patrol, which consists of six watercraft and, during the peak operating season Memorial Day to Labor Day, a staff of about 80 personnel. The lake is open 24 hours, though after dark there is a 15 m.p.h speed limit for water craft. The Water Safety Patrol runs full time every summer. Their mission is threefold: water rescue, boater assistance, and boater education. To join the agency, every member must be minimally trained as a lifeguard, with Red Cross certification. For Boat Patrol personnel, a hybrid level of medical and rescue training, under direction of the Medical Director, creates an advanced level of medical certification, different from the EMT-B level in the state. Responding to watercraft accidents, including those involving a 200- passenger excursion boat, makes training beyond medical rescue important. Medical emergencies do happen on the water, and a 28-foot “boat as ambulance” transport is what you have to work with. Training on O2 administration, Epi-Pens, and advanced CPR techniques buy critical time to begin medical intervention en route to shore and a waiting mutual aid transport. In the rural setting surrounding the lake, most departments are staffed by volunteers. Only one paid fire department operates in the area. 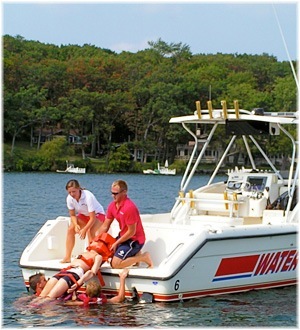 Training in the various scenarios, such as transferring a medical emergency from one boat to another, or getting a victim backboarded in deep water when there are waves and wakes and then lifted into a boat, make the Water Safety Patrol certification unique. Calls are received by either Marine Band Radio channel 16 or more frequently by cell phone into the Water Safety Patrol dispatcher. Responders are then reached via two-way radios. "If a boater calls 911, it is received by the county, who will then dispatch us and the local municipal agencies to respond,” Ted explains. Because the Water Safety Patrol is not within the 911 system directly, Ted suggests that visitors to the lake should know the direct WSP number to dispatch. He encourages everyone to call 262-245-6577 directly, in addition to 911, for emergencies on the water. This saves the precious time the county would have needed to call Water Safety Patrol, who can be en route to the incident while the municipality responds to the beach. Boater assistance is a second important response for the agency. 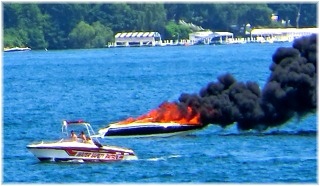 Stranded boaters, whether out of gas, needing a tow, or capsized, are the responsibility of the Water Safety Patrol.